All of our programs involve a play based curriculum for children ages 2 years and 9 months old up to 6 years old. Children are placed with peers of similar age and readiness. The curriculum is designed to foster a child’s natural curiosity, providing many opportunities for sensory exploration. In a warm and caring environment, we encourage children to question, to articulate feelings, to experiment with various methods of problem solving, to empathize with others, and to develop self-help skills. Pre-reading and pre-math skills organically occur through activities offered in play situations. 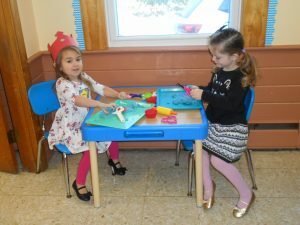 We are licensed by the Commonwealth of Massachusetts Department of Early Education and Care. We offer 2-day, 3-day, 4-day and 5-day programs from 9am until noon. An additional Stay for Lunch option (children bring a lunch to school) is available daily until 1pm. There is an Extended Day option until 3pm on Monday through Thursday. Toilet training is not a prerequisite for enrollment. Parents/ Guardians are welcome to visit the school at any time that their child is in attendance. Our school maintains an Open Door Policy, encouraging applications from all, without bias toward race, religion, cultural heritage, national origin, political beliefs, disability, parental marital status or sexual orientation. Error: Error validating access token: Session has expired on Thursday, 16-Aug-18 19:01:59 PDT. The current time is Tuesday, 23-Apr-19 06:03:50 PDT.